Welcome to the last stop on today’s OWH Blog Skip! I hope you’ve enjoyed all of the clean and simple techniques we learned from the Online Card Classes “Clean and Simple” class. What a great class! I created this card in a techniques lesson about Watercolor Blocking. This technique works very well with Distress Inks and water or Perfect Pearls Mists. I first heat embossed the stamped images in Detail White and then watercolor blocked over with the Distress Inks on water-saturated ink blending foam pads. For more cards I created in the class, click on the thumbnails at the bottom of this post. Thanks so much for stopping by! Please leave a comment for a chance to win a bit of blog candy from me and a chance to win Online Card Classes or other prizes just for skipping today. Make sure you leave your email address when you leave your comment and I’ll draw a random winner on Monday! To return to OWH Stars and Stamps, Click here. I must say that I’m really excited because I just received my first “thank you” email from an Air Force Major in Afghanastan–just as I was posting this! I’m so thrilled to have received a personal note. It makes what we do mean even more! This entry was posted on Friday, February 3rd, 2012 at 11:50 pm	and tagged with cardmaking, clean and simple stamping, stamping and posted in Clean & Simple, OWH. You can follow any responses to this entry through the RSS 2.0 feed. Love your card. Great color combination . Wow this is just BEAUTIFUL, Yvonne!!! That backround is amazing. Thanks so much for the inspiration! Cruise bound in a few hours! love, love, love your choice of colors! What a beautiful technique! Great job! I took the class but didn’t try this one yet. Thanks for the inspiration to get it done! This card is absolutely gorgeous! A lot of time was put into this, well worth it. Congrats on receiving a note from a hero. It sure keeps us wanting to do what we do. Yvonne, so happy for you that you received that thank you email from the troops. It really is a huge boost when that happens. This card is beautiful. It looks totally beyond MY capabilities but I just love the lokk of the lacy trees. beautiful – I haven’t accomplished anything with this technique yet – you did a great job with it. What a gorgeous card Yvonne!! You did a fabulous job on this and I love the ink colors that you chose! I was also a part of the CAS Class and loved it and can’t wait for the next one in March. Congratulations on receiving your first Thank YOU! That’s awesome. How did they know it was your card? I would be thrilled too and I’m so happy for you! Thanks for being part of this skip and for sharing your wonderful talent! Have a wonderful day! Thanks for sharing this awesome technique! This skip has been very inspiring and I can’t wait to try some of these. Thanks for the awesome prizes also! Gorgeous! I love your butterfly one also. Wow–I really like this technique! i really am loving the color blocking technique want to try it!! Very pretty! I haven’t tried that technique yet. This is just a gorgeous card. I would love to learn this technique. Thanks so much for sharing this and inspiring me. Beautiful card and it has such an artistic, fine art feeling to it. This CAS technique is one that I need to make a point to try. Congrats on hearing from one of our heroes too. I know from experience that it is such a great feeling to know that your card making has impacted someone. I admire (and envy) those who emboss. This is one area I have not attempted. Your work is beautiful. Thanks for sharing. Beautiful card! Love the soft background and the embossed stamping is gorgeous. I’m in love with this card. I’ve got to give this a try. Gorgeous!! Love your card, Yvonne. The colors are wonderful! Gorgeous technique, love the resist embossing, too! How cool to hear back from the major! Love the for you blue card, but they’re all great! Amazing! and just beautiful! Would love to receive a card like this in the mail. This is SUCH a gorgeous card — love the choice of colors in your colorblocking — and thanks for including an explanation of how you did this — I haven’t taken the class, but this looks intriguing! Your other CAS card posts are awesome as well! Thanks for an opportunityt to win, and thanks for all you do for OWH! Love your cards! Love your blog! Thank you so much for the inspiration, too! So sorry the skip is over because I just can’t get enough of the CAS style. is calming and serene. I can think of lots of ways to use this design! Your cards are really lovely, the clean asnd simple look works great. Thanks for sharing. What a beautiful card. Love this technique you used for the background. Thanks for the idea. I must get some “detail” embossing powder! Your image pops on that watercolor paper, and I love it! Thanks for skipping with us today. OH MY! W0W! Hope to find a job soon to but supplies to try this! Just Lovely! Oooooh, lovely look! Love the colors. Your card is so lovely! Great job. Stunning!!! Love the colors that you selected for this technique! Love the watercolor blocking on your card. will have to try this. Thanks for sharing. This is really lovely! Great technique! They are all lovely, but the showcase card is GORGEOUS! I’m a sucker for trees and color blocking technique. Oh I like that background–nice! Thanks for the chance to win! Love the colours on your card…so pretty! Thanks for sharing. 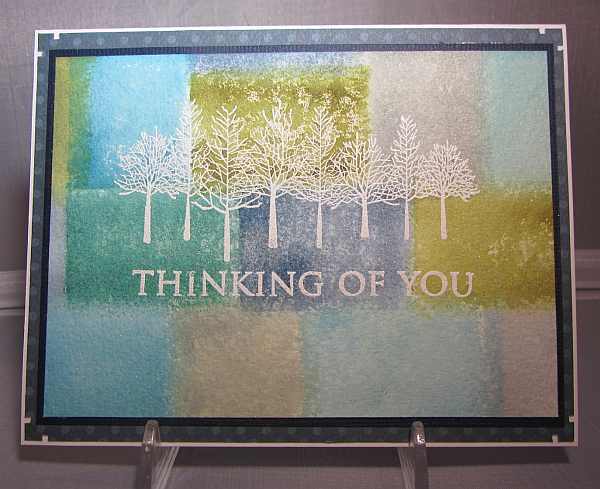 Love the simplicity of your card and the great subtle colors for the background – very pretty ! Thanks for sharing ! Beautiful card, Yvonne, but looks like lots of work. Would need some additional products should I decide to try this. Results are definitely worth it though. How sweet to receive a nice thank you from an AF Major! Thanks for the chance to win blog candy. This “skip” was one of the best I’ve followed. Thanks for sharing! Gorgeous card! I really want to try this unique technique! How neat for you to hear from the Major! Beautiful card – the colors you put together are beautiful. What a wonderful idea of how to do cards. Thanks for sharing. This card is simply amazing! I’ve never tried a technique quite like this, but you may have inspired me to just give it a shot! TFS! Wow, I really like that watercolor blocking. LOVELY CARD. I am a big fan of memory box stamps and dies and love the corner punch. use it a lot. the watercolor effect is beautiful. Yummy…cool technique and love love that image! TFS!!! LOVE this technique! How awesome! Thanks for inspiring with your lovely card! Pretty card! I love the stamping!! Love the watercolor blocking background. I’ll have to give this a try. Thanks for sharing this technique and being part of the OWH skip! Beautiful, beautiful, beautiful!!! Love your colors and the entire technique just works! It’s neat that you got a personal thank you from a Hero. I’m betting that this card is one that gets picked immediately!! Thanks for all your support of OWH and our Heroes. Now I’m going to go check out the other cards that you made in class, looks like it was a lot of fun! To have received that thank you, would have iced the cake for me too! Your card is wondereful. Wow! was my first thought on seeing this card. I definitely want to try using watercolor paper. Thanks for sharing your beautiful cards. Very pretty card! Love the different colors in the background. Congrats on getting the thank you email – you totally deserved it! Gorgeous!!! I would LOVE to learn this technique! Thank you for sharing! Distress inks are great …. and I can’t wait to buy some of the distress markers. Tim Holtz has great ideas! Your card is beautiful! Thank you for sharing your creativity. This technique is beautiful and new to me. Thanks for sharing a terrific example of how wonderful it can be. Thanks for the technique tip. Must try it. So effective on your card. Look complicated – but clean and strong! But not at all fussy. Just right! Your card is just beautiful – love it! Thanks so much for sharing this! Wow! what a georgeous card! I absolutely love the watercolor and the masking! Thanks for sharing! I MUST do this technique! I love the colors and the embossing. Just fabulous! Your cards are awesome…totally breath taking. Thanks for the ideas and inspiration. Love the colors and the embossing is very impressive. You did a fantastic job on this card and all of your others too. I thought your lesson card (the butterfly card) turned out just perfect. — I’ll have to try this technique. Congrats on hearing from a hero. Thanks for sharing your wonderful work. I looked at all your cards. My favorite is the butterfly. It’s so simple,,,but beautiful! Loved your card and must learn how to do that technique. Gorgeous. Congratulations from hearing from one of our heroes…makes you want to make even more cards, doesn’t it? Thanks for sharing your beautiful cards. I love your cards – CAS is a great style. Thanks for sharing all your cards from class. That watercolor technique is amazing! I have GOT to try that! Thank you so much for sharing that beautiful piece of art! Nice technique.The white embossing sure pops. What a gorgeous card! And congrats on getting a note from Afghanistan. I support an organization called AnySoldier.com and the first time I got a letter from Iraq I was just beside myself with joy. It makes it so much more personal when you hear from the people you are supporting and helping! Really neat looking card, I need to try that technique. Ooooh, just love your card and the colors. TFS the process with us as it’s a great idea. What a great technique for the background! Thanks for sharing all your wonderful cards!